PARM Panel Discussion at the Sustainable Agronomy Conference in Madison! 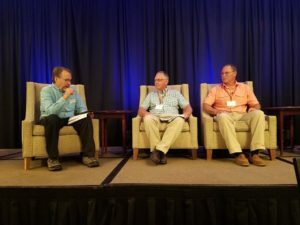 HomePARM Panel Discussion at the Sustainable Agronomy Conference in Madison! Our own Tom Green (pictured on the left) is presenting at the Sustainable Agronomy Conference today in Madison! Lee Orians (on the right) is a CCA with Heritage Cooperative, a participating ag retailer with PARM. Our panel discussion also includes Neil Bair (middle), grower and customer of Heritage Cooperative. Today we are discussing sustainable agronomy success stories! Lee Orians states PARM’s variable rate technology cost-share funded by the Great Lakes Restoration Intiative has generated approximately $160,000 in company revenue. To find out more, or if you are interested in becoming a PARM member, please contact our outreach coordinator, Caitlin Leahy at caitlin@partnershipfarm.org!